Below is the manuscript from my Presidential Address given to the 2016 Southern Baptist Convention on Tuesday, June 14, 2016. You can find a video of it here. These words are relevant not just to America, but also for every church in America, including our Southern Baptists churches. Since last year’s convention, the Spirit of God has pressed upon my heart a continual, growing, and aching burden. It began within hours of the conclusion of last year’s convention when the shocking report came from Charleston, South Carolina, that the pastor of the Emmanuel African Methodist Episcopal Church, along with eight of his members, was shot and killed by a 21-year-old white gunman who opened fire in their Wednesday evening prayer service. Now, just hours before we began our 2016 Southern Baptist Convention, the deadliest mass shooting in the history of the United States occurred in Orlando, Florida. With forty-nine people left dead along with fifty-three people injured, and while America is stunned by this act of terrorism, ISIS is rejoicing. Since all human beings are made in the image of God, this attack against gay Americans in Orlando is an attack on each of us. As followers of Jesus Christ, we stand against any form of bigotry, hatred, or violence against our nation and against any people in this world. In one of my recent trips to Washington, DC, I jogged around the National Mall one morning. Passing by the United States Supreme Court, the United States Capitol Building, the Washington Monument, the World War II Memorial, the Lincoln Memorial, and then all around the Mall again, this burden and this phrase was continually on my heart. As followers of Jesus Christ, everything we believe in and place in high value is at stake. How do we not see this? As the world is becoming more lost, more Christians around the world are being persecuted and killed for their faith than any other time in modern history. With the continual and growing threats of Boko Haram, ISIS, and other persecution, we are seeing one of the most severe refugee crises in our generation. Simultaneously, with over 6,000 unreached people groups globally, we are reducing our mission force by 1,000 missionaries. Southern Baptists, the stakes are high! Furthermore, back home in America, while we are seeing a growing lostness in our nation, the things we have held dear are at stake. Laws that declared marriage to be only between a man and a woman have now been overturned. Government is now overreaching to the point of telling you that your biological gender is no longer the criteria for where you are supposed to go to the restroom in public settings. Racial unrest, injustice, and violence are growing and are an indictment against us. The dignity of human life is being demeaned to such a point in our nation that the recent unfortunate death of the gorilla named Harambe has now resulted in a passionate national debate. The sentiment is captured in the title of a May 30th article in The Washington Post entitled, “‘Shooting An Endangered Animal Is Worse Than Murder’: Grief Over Gorilla’s Death Turns To Outrage.” The media has been dominated with this story. But I have a question today to you and to our nation. Where is the outrage in America over the killing of unborn children and toward Planned Parenthood over the sale of the body parts of these aborted babies? Furthermore, political discourse and debate has become so degenerate, it is difficult to know whether your children and grandchildren should even be allowed to watch it on television. While the rainbow colors glisten from the White House as they celebrate this redefined and new morality in America, I declare humbly today in Jesus’ name and with the authority of the Holy Scripture, these things are not some new morality, they are signs that our nation is on the ragged edge of moral insanity. Simultaneously, unlike anything we have seen in our generation, these new realities are pressing in upon our pastors and churches and we are struggling to navigate toward a flourishing future together. I have highlighted these things in order to say to all Southern Baptists, to all evangelicals, and to the people of America: The stakes are high! As spiritual leaders, there is not one of us who can sit out in this critical hour. Now is not the time for the churches in America to call time out and retreat to their land of comfort and sit around dissecting their theology and the theology of others. To every Southern Baptist layperson who operates daily in the arena of business, healthcare, education, entertainment, sports, law, politics, government, or serves in our military, please understand that the stakes have never been higher in this generation. Our pastors and churches need you to be more engaged on Sundays than ever before, but we also need you intentionally integrating your faith on the front lines of our culture in everything you do daily regardless of where you are. One of the major reasons this is important is that our religious liberty in America is at stake. Though religious liberty is chiseled into our First Amendment, the Wall Street Journal published an article on April 10, 2016, asking a dynamic needed question: “Why Are Companies Taking Sides Against Religious Liberty?” Make no mistake about it. The stakes are high in America. Though we desire our government to grant the blessing of religious liberty for all, do not forget, it is Christ alone who sets us free, not our government; religious liberty is a gift from God Himself to each person. Almost five centuries before Jesus, an Old Testament book speaks of an era somewhat like today. God’s people had been taken away to a foreign land called Babylon. Jeremiah had prophesied this judgment would come, so they needed to settle in, plant their lives, and build their future because they would be there for a while. Persians were now in control, being led by King Ahasuerus. While providence was at work to fulfill God’s eternal purpose for His people, an evil man named Haman began to plot to destroy the people of God. He created insurmountable circumstances that would lead to the certain death of the Jewish people. The stakes were high. Yet, our God reigns. While this villain was permitted to arise, at the same time, the powerful Hand of Providence was raising up a faithful man and a faithful woman. Both Mordecai and Esther would rise up to this occasion against overwhelming odds when everything was at stake. They would stand up and trust God with the outcome. Mordecai was a Jewish exile and the older cousin of Esther, whom God had raised up miraculously at this moment in history to be the Queen of Persia. Esther sent this reply to Mordecai: “Go and assemble all the Jews who can be found in Susa and fast for me. Don’t eat or drink for three days, day or night. I and my female servants will also fast in the same way. After that, I will go to the king even if it is against the law. If I perish, I perish.” So Mordecai went and did everything Esther had ordered him. Providence placed Esther at the right place at the right time to accomplish the purpose of God. To every pastor and church leader here today, God has you where you are at the right time to accomplish the purpose of God. The goal of Haman was to eliminate all the Jewish people. The King accommodated the desires of Haman and it became the outrageous law of the land. The Jews were to be destroyed. Mordecai and the Jewish people began to fast, weep, and dread their fate. The stakes were high. Everything was at stake. When Queen Esther feared for her people and for herself. Esther was not scheduled to see the king for thirty days and only he could change this law. Furthermore, if she tried to see him before, it could cost her life. The stakes were high. “Let The Church Stand Up,” he did so from multiple texts. But when he did use this text briefly, his remarks were interesting and still have relevance today. He stated, “Baptists must feel deeply that this is the time and the hour for Christ and His church to act.” Forty years later, I could not agree more. Now is the time again, for Christ and His Church to act. While our nation is morally sliding toward Gomorrah, our greatest problem is spiritual. The stakes are high. We must have the same perspective and the deep conviction of Mordecai. We must believe that God will prevail! “Who knows, perhaps you have come to your royal position for such a time as this.” Mordecai was deeply convinced that God had exalted Esther to be Queen to speak and to act, regardless of what happened to her. Mordecai and Esther knew the stakes couldn’t be higher. How did she respond? Well, let me tell you first what she did not do. Esther did not stand before the people in the kingdom and appoint a task force to study and bring recommendations concerning this issue. Esther did not attack Haman and send out a tweet, or get on Facebook and go on a rant like a child, or get on a website and comment about how bad Haman was, nor did she write about how evil he was. Was he evil? Were the times severe? Absolutely! The stakes were high! Remember this: If Satan cannot get us to do the wrong thing, he will get us to do the right thing in the wrong way. Both are sin. So what did Esther do? Esther wanted Mordecai to assemble the Jews and tell them to fast and pray for her for three days. She would do the same. Then, after they had all cried out to God for three days and three nights in fasting and prayer, she would go to the king even if it cost her life. She said, “If I perish, I perish.” So Mordecai and all the Jews fasted for her for three days and three nights. Esther went before the king and received his favor. She invited him to a banquet along with Haman. In this banquet, she exposed the evil of Haman and his destructive goals. The king became outraged and commanded Haman be hung immediately. Esther and the people were spared. Miraculously, Mordecai was raised up to serve the king, and together they changed this outrageous law to preserve the people of God. God answered their cries of prayer and fasting. Providence was at work. Providence is always at work. Even though the stakes couldn’t be higher in America, this is still true today and I do believe God is at work in America. Yet, I want to be more than clear. America is facing a leadership crisis. Where are the leaders? We need leaders who can bring people together from all socio-economic levels, ethnicities, and generations toward a common vision for the future. These are not just rare in the world of politics, business, or sports; they are also rare in the religious world, including the Southern Baptist Convention. America is facing a relational crisis. Our nation is divided. We are known more for being the divided states of America than the United States of America. The national political races we have observed over this past year personify the fractured, dysfunctional condition in America relationally. America is facing a racial crisis. Twenty minutes from where we are meeting today is Ferguson, Missouri, where in August 2014, the events occurring there became the tipping point regarding the racial crisis in America. This turning point in our nation personified what was already going on under the surface around the country regarding racial issues. The towns and cities in America can no longer ignore this issue. Any form of racism defies the dignity of human life. Regardless of the color of one’s skin, God has put His Divine imprint on each one of us. Where has this conversation been in our national political races for the highest office of the land? The silence from both parties has been deafening. This cannot be. Sadly, tragically, and regrettably, it was 159 years ago that the infamous court case of Dred Scott v. Sandford resulted in a decision that many still call to this day the single worst Supreme Court decision in American history. This lower court case that began in the city of St. Louis ascended to the highest court in the land in Washington, DC. It was on March 6, 1857, when the Supreme Court ruled that all slaves and all their descendants ­— even if they became free — were not and could never become citizens of the United States. It was declared that as a black man, Dred Scott was not recognized as a citizen of our nation and did not have the right to sue for his freedom. While this decision was in complete violation of the United States Declaration of Independence that says, “All men are created equal,” it elevated this staggering tragedy of slavery in the public arena of American life. This court decision furthered division in our nation and stoked the already flaming fire that led toward the Civil War. Listen very carefully: Within a fifteen-minute walk from where we sit today in downtown St. Louis is the Old Courthouse, where in 1846, Dred and Harriet Scott initiated a lawsuit for their freedom. This became a defining moment in our history. Before I go further, I want you to meet and greet someone special who decided to come and visit our convention when she was told by a friend I would be mentioning Dred Scott and hosting our racial unity panel this morning. Lynn Jackson is the great-great granddaughter of Dred and Harriet Scott and is the President and Founder of the Dred Scott Foundation here in St. Louis. Would you welcome Lynn Jackson to the Southern Baptist Convention? Why is all of this so important? I believe the issue of racism is from Satan and his demonic forces of hell. Why do I believe this? Racism is an assault on the gospel of Jesus Christ. Since the essence of the Gospel is spiritual adoption that releases us from our prior state, anything contradicting that must be a lie about Christ and subversive of His finished work on the cross. Racism is completely opposite of the message of Christ. Racism is completely opposite of the message of love. Racism is completely opposite of the message of reconciliation. While our nation is being divided across racial lines, uniting His people across racial lines best reveals God’s heart for all the nations. In this desperate time in our nation when the racial tension is building rapidly, our Southern Baptists churches must rise together as one and decry this atrocity and lead through it in the gospel way. Southern Baptists, silent denominations die and their message dies with them. Let’s be clear and not be silent. We are not black churches. We are not white churches. We are not Latino churches. We are not Asian churches. We are the Church of Jesus Christ. We are members of the same body. The hope for all racism to end in America is in Jesus Christ and in His triumphant church. This is why we are having in this morning’s session, A National Conversation on Racial Unity in America. Let the church rise. The stakes couldn’t be higher! America is facing a spiritual crisis. This is our greatest crisis. All other crises surface due to this major spiritual crisis we are facing as a nation. We need to stop treating just the symptoms. It is time to go to the root of our problems. America is in a major spiritual crisis, perhaps the worst in our generation. The stakes are high! The stakes couldn’t be higher! In this critical hour, how should our Southern Baptist Convention respond? What actions should our Southern Baptist Convention take? In my final address to you as president, I want to challenge us to these five actions. Southern Baptists are no longer in a battle for the Bible, but in a battle with one another. The very soul of our convention is at stake. Almost two years ago when I became president, I was determined to do all I could to bring us together. I have given myself to this task, not just in words, but also in deed. I have gathered groups from all sizes of congregations, groups of church leaders and convention leaders, state leaders and national leaders, and members from different ethnicities and generations. Yet, we find ourselves in a continual struggle to come together in unity. Why? Unquestionably, we are affected by the culture we live in today. Narcissism and independence infects us just like it does others and challenges our paradigm of working together. Transition within our national entities and state conventions is occurring, and adjusting to change can be uncomfortable for everyone. During this “for such a time as this” moment, not one decision we make happens in isolation. You are not representing just yourself. We are family. We need to stop letting distractions drown out the voice of God to us so we can articulate the voice of God through us to America. There is not one enemy in our culture that will destroy the Southern Baptist Convention; but the enemies from within of pride, egotism, and independence will. These turf shepherds build walls relationally and threaten our spirit of cooperation and our work together. In this social media world, we need to cease writing or saying things that can be easily misunderstood. We need to understand that one day we will answer to God for every blog, article, or tweet we write, and every conversation we have with one another. Unity is work! Unity will not happen without intentionality. If we are so passionate about reaching the world, we need to live out what Jesus prays for us in John 17:21, “May they all be one, as You, so the world may believe You sent Me.” We need to love one another. Now is the time for Southern Baptists to come together. My address to you last year was on this very subject: Now is the Time to Lead. I am more convinced this year than last year, America and this entire planet needs Southern Baptists to lead. We need to lead more than just in number of churches and members as the largest Protestant denomination in America, but we must lead with influence. This begins by us understanding the game is out there in a world that is without Jesus Christ. The game is not inside of our churches and not inside of our Southern Baptists national entities and boards, state conventions, and associations. We are called together to reach the world for Christ. We are not a convention of entities, boards, state conventions, and regional associations; we are a convention of churches. Churches, lead. Pastors, lead your churches. National entities, boards, and committees, state conventions, and associations: Your role is to assist our churches in their mission of reaching the world for Christ. The churches do not serve these structures and systems, but these structures and systems and their long-term future in our convention will depend on one thing: Their effectiveness in serving the churches to fulfill their God-given mission of reaching the world for Christ. Systems and structures do not create the work of God. Systems and structures flow from the work of God. This is why we must always seek the Lord and always be willing to conform who we are to what God is doing among us. Everyone has a place, so let’s find our place and lead from there. Now is the time for Southern Baptists to come together and for us to lead. We would do well to re-prioritize reaching our own village, town, region, or city for Jesus Christ. America is lost from the smallest town to the largest city. From Mississippi to Montana, from Maine to New Mexico and from Washington to Florida, America needs Jesus! Pastors and churches do a better job talking about reaching that city out there in America one thousand miles away or that country on the other side of the world than we do about reaching the very town where we live. We need to recapture the vision of reaching our own town or city for Jesus Christ. This is where it begins in reaching the world for Christ. This is why pastors and church leaders must adjust their thinking and prioritize evangelism in their church, both personal evangelism and church evangelism. We talk about the gospel more than we actually advance the gospel. Pastors, whatever you do, present the gospel through your preaching and call people to respond to Jesus Christ weekly. What will it take for us to face this problem head-on, stop rationalizing about it, and take strategic actions to change it? After the first full year of the conservative resurgence in 1980, our churches baptized 134,530 more people than we did this past year. But should we really be surprised? Let’s be honest with ourselves today. We have criticized evangelism right out of the Southern Baptist Convention. A culture of skepticism about evangelism has crept into our convention. Equipping our people to do evangelism has departed from our churches. Event evangelism is no longer being done because some know-it-all, want-to be prognosticator deemed it irrelevant. While theological debate is ascending and is applauded loudly in our convention, evangelistic fervor and fire is being extinguished and the masses are silent about it. If we just had one-fourth of the passion for evangelism that we have for the debate over American politics, SBC internal politics, theological discourse, blogging, social networking, and analyzing someone else’s ministry when our own is falling apart, we could change the world for Jesus Christ. Our convention celebrates everything but the main thing and then we wonder what happened with the main thing… evangelism. Evangelism is dying in our churches. Evangelism is dying in our convention. Wake up! Sound the alarm! Southern Baptists talk about evangelism more than we do evangelism. This must change, and change now. We are in a defining moment. The stakes are high! It is imperative for the future of America and the future around the world, as well as our own future, that our convention in St. Louis becomes the gateway when evangelism, once again becomes the priority of our churches and our convention. Now is the time for Southern Baptists to come together, lead, and evangelize. Thank you, Southern Baptists, for what you are doing. Our giving through the Cooperative Program has experienced an encouraging upsurge in the past two years. To the glory of God, after the first eight months of our giving through the Cooperative Program, the giving of our churches is up 2.65% from the previous year and reflects an increase of 6.13% over our projected budget for the current year. Let’s continue forward, encouraging our churches to continue to evaluate their gifts through the Cooperative Program each year. Encourage them to increase their personal stewardship and challenge your church to increase their stewardship in giving more through our Cooperative Program. Our consistent growth through the Cooperative Program is the key to our Great Commission work statewide, nationally, and globally. Thank you, Southern Baptists, for what you are giving through our mission offerings. Our churches are stepping up financially to help us push back on lostness in North America, as the Annie Armstrong Easter Offering for North American Missions is right now $6,052,063 ahead over last year. To God be the glory! Let’s continue to finish strong this year in giving to this offering. Relating to our international missions offering, I have told people across the nation that even a carnal Southern Baptist knows there is something not right about bringing our missionaries home. All of our churches have stepped up and given the largest Lottie Moon Christmas Offering for International Missions in our 127-year history: $165.8 million, an increase of 7.6 %. To God be the glory! We can do more together! We need to agree. We need to unite. We need to pray together. In this hour, it is our responsibility to pray extraordinarily. This is why we have allocated the entire session tonight for A National Call to Prayer for Spiritual Leadership, Revived Churches, and Nationwide & Global Awakening beginning at 6:30 p.m. This is more important than anything else you could possibly do. How can we come to St. Louis, knowing what our nation is facing now and in the future, knowing the issues the world is facing, and knowing where our churches and pastors are, and not allocate time for serious intercessory prayer built upon the Word of God being expressed together through the people of God? In this hour and even tonight, we need to live out our spiritual leadership by leading the way and calling out to God together. You may have given up on America, but God hasn’t. You may have given up on your church, but God hasn’t. You may have given up on ministry, but God hasn’t. You may have given up on yourself, but God hasn’t. Our God can do anything, anytime, anywhere, with anyone. God can do more in a moment than you could ever do in a lifetime. You have no right to prognosticate doom about America and where we are, or doom upon the Southern Baptist Convention, or doom upon the church or doom on anyone else or even yourself, unless you are willing to humble yourself before God and pray. We all want to bring prayer back into our public schools, but I wish we would bring prayer back into our churches. Churches give more time in their worship services promoting their next event than they give to practicing prayer in their worship services. Prayer brings the walls down! Prayer crosses over the perceived barriers of ethnicity, race, and generations, bringing down the walls that divide us. Let the walls fall down! Now is the time for Southern Baptists to pray. Conclusion: Fifteen years ago this coming September 11, 2,996 people were killed in America and more than 6,000 other people were injured by the deadliest terrorist attack in world history. It was the most devastating attack on American soil since the Japanese attacked Pearl Harbor seventy-five years ago, December 7, 1941. Each of us who were alive and old enough, remember our exact location the moment we began to hear and see the unfolding live news of the 9/11 attacks on our nation. I can remember not just where I was at the time of the attacks, but almost everywhere I was and everything I did that entire day and night. On September 11, 2016, on the 15th anniversary of 9/11, I want all of us to remember where we were on that day and what we were doing. I want to humbly request that we each prayerfully consider not only being in church that day because it is a Sunday, but on that Sunday, allocate the day to praying for our nation. America’s greatest need is the next Great Spiritual Awakening. The churches of America need to pray for our country in our worship services. Not just mention it, not just pray, but pray extraordinarily. Here is a challenge each of us can do: Pastors and churches: On September 11, consider giving your entire worship service or at least eleven minutes of each service to completely focusing on praying for America. There are so many things we could pray for our nation, from our upcoming elections, to our president, our Congress, our Supreme Court, our governors and state legislative bodies, our mayors, city councils, and school boards, our first responders, our schools and universities, our military, for the churches in America to be revived, for our own church to be revived, for America to experience Spiritual Awakening, and for the world to be reached for Christ. The possibilities are plentiful. Southern Baptists, when will we wake up and hear what God is saying to us? Could it be that our God is calling us to repentance and calling our nation to repentance? Now is the time to return to God. We do not want to become the nation that falls into the experiences recorded in Jeremiah 7:28, “This is the nation that would not listen to the voice of the Lord their God and would not accept discipline. Truth has perished—it has disappeared from their mouths.” Now is the time for us to repent, return to the Lord, plead for mercy, and call our nation back to God. The stakes couldn’t be higher! But let’s be clear: The church cannot call America to repent until the church repents. We need to repent of our prayerlessness. We need to repent of our unbelief. We need to pray for ourselves to get right with God and right with one another in this critical hour. Southern Baptists, the stakes are high. America, the stakes couldn’t be higher. Now is the time to pray. Beginning today. Beginning tonight. Beginning now. The Stakes Are High… Now is the Time to Pray! 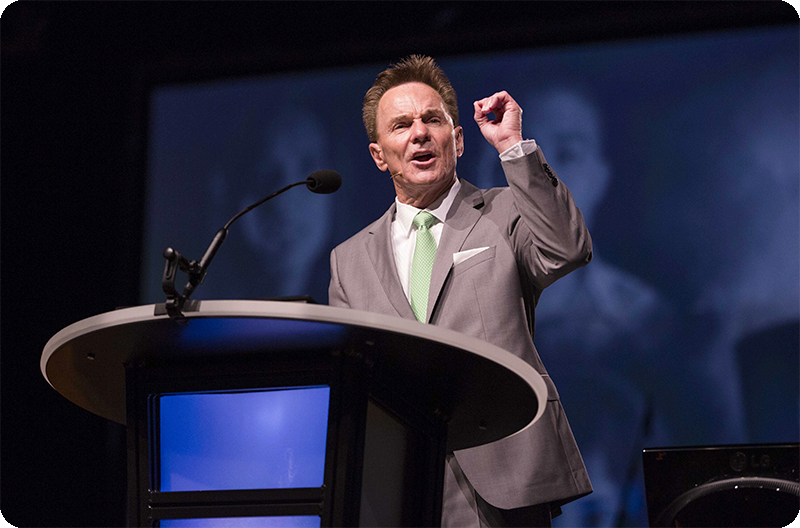 Dr. Ronnie Floyd is currently serving as the President of the Southern Baptist Convention. The Southern Baptist Convention is America’s largest Protestant denomination with more than 15.7 million members in over 51,094 churches nationwide.